SHINY. Just like a crow, I’m super attracted to shiny things. When I saw this sparkling blue/gold top at Repris ( one of my fav vintage/second hand stores in Stockholm) I knew I had to get it. I mean, it’s shiny AND blue (my all time favorite colour). Almost too good! This entry was posted in Outfit and tagged Outfit, Repris, second hand, Vintage by Carolina Engman. Bookmark the permalink. i love the shirt! i wish we had good second hand stores here like you do in stockholm! Really great top! You look just like Lily Donaldson in this picture! Heeey, vart ligger detta Repris? Love glittery things too, they make a simple outfit look unique! Love these lasts outfits you’ve shown specially the latest one with THAT amazing jacket! Quick question- what kind of digital camera do you have??? Thank you in advance, Carolina! sometimes i just think that u look soo much like mariana weickert – brazilian top model – not in this picture though..
by the way, i luv ur blog! oh in my local vintage shop on the weekend i saw a tee like this in silver and grey i didnt get it wish i had… love your finds!! you are such a savvy vintage shopper! everytime I drop by here there is a new little treasure you’ve encountered, the shirt really is gorgeous. I’m a crow too and I might just steal that shiny thing from you so I can look as lovely! I love that you echo the background, ha ha. ussr posters) it’s pleasant to see something native! Great photo! 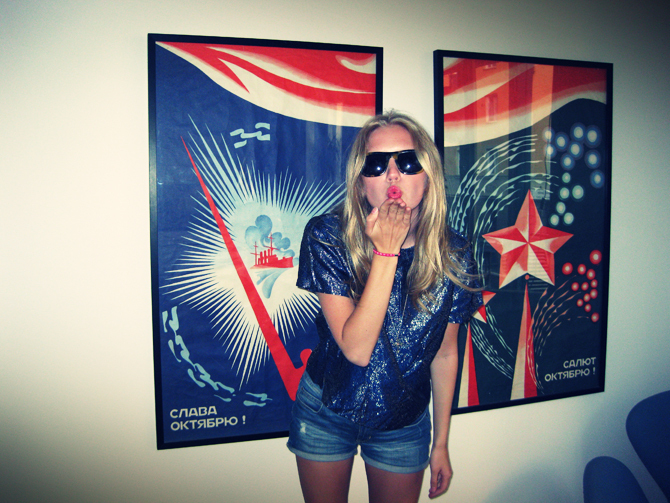 Love the sequin tee and the posters in the background are very cool. you look great as usual!!! Oooh den tröjan var fin ! Seriously love it, and the lipstick. Will have to check out Repris when in Stockholm! Great picture, so gorgeous! What’s with the Russian posters in the background btdubs? You look so amazing! Gorgeous!! vart ligger den affären i stockholm? were is that store in stockholm?